We, the Finance Committee, appointed from the General Committee elected at the Parish Meeting, are entrusted to arrange the finance for the Celebration in Goudhurst of the Coronation of our King and Queen on May 12th. We therefore earnestly ask all Parishioners to assist to this end and thus maintain the High standard achieved by our Village at the Jubilee. Provided that sufficient funds are forthcoming it is proposed to conduct the celebrations on somewhat the same lines as those which were followed so successfully two years ago, that is to say, with special regard to the enjoyment of the children. This would involve the expenditure of approximately £150. The Parish Meeting unanimously resolved that all funds should be raised by voluntary donations and not by the infliction of a rate. We hope that this appeal will meet with a very generous response from you, and that you will send your donations as early as possible to the Hon. Treasurer, Mr G. V. Hinds, Beechurst, Goudhurst, so that it may be known at an early date what funds will be available. P.S. The Programme aimed at includes Tea, Sports and Coronation Mugs for the Children; A Dinner for the Old Folk; A Carnival, Torchlight Procession, Bonfire and Fireworks. Donations may be earmarked for any particular object. £132 9s 1d was subscribed by the parish and £24 7s 7d was raised from a house-to-house collection. 9.0 Goudhurst Band on the Plain. 10.0 Service in Parish Church. 11.0 Unfurling of New Flag on Church Tower and singing by the Choir of National Anthem. 11.10 Affixing Commemoration Plates to Coronation Trees on New Road. 12.0 Dinner for Old Folks in the Hall. 3.45 Sports for the Children and Adults in the Vicarage Field. 4.0 Tea for all the Children in the Hall and Presentation of the Coronation Beakers. 5.45 Carnival Parade on Plain for Judging. 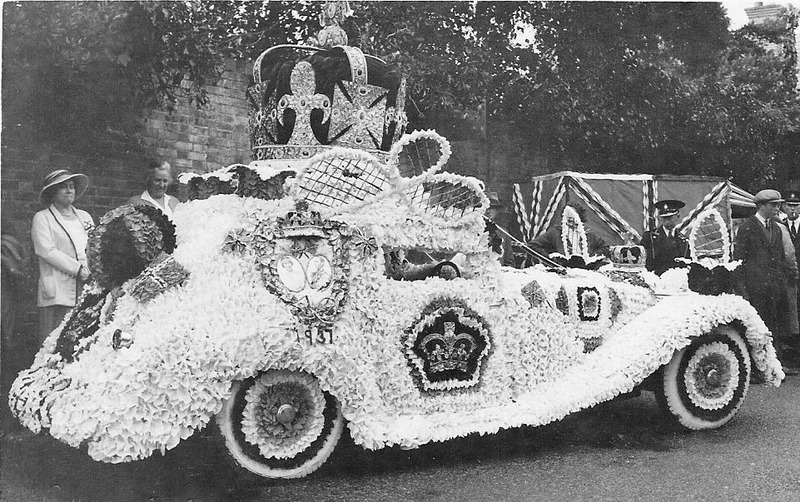 6.45 Carnival Procession via Church Road, Cranbrook Road, Chequers and College to Plain. 8.15 Presentation of Prizes, by Miss L. Jessel, for Carnival and Decorated Vehicles. 9.15 Assemble on Plain for Torchlight Procession. 10.0 Bonfire and Fireworks in “Five Fields,” Dancing, etc. The lucky programme number was ‘452’ but no-one claimed the prize. 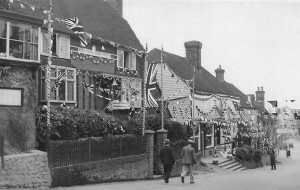 About a week beforehand the Village was decorated with bunting, flags, streamers, banners and lights in preparation for the celebrations on the big day. The village pond, the War Memorial and the church were floodlit at night, and shop windows were enthusiastically decorated. 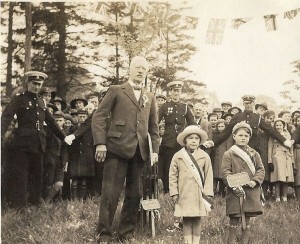 The Children of Goudhurst send to Your Majesties upon Your Coronation Day expressions of their loyal duty and service. The Children of Winchet Hill, Goudhurst, send Loyal Greetings to Your Majesties on the occasion of Your Coronation. To the Children of Winchet Hill and Goudhurst Schools. The King is much gratified to receive your message of congratulation on the occasion of His Majesty’s Coronation. I am desired to express his warm thanks to all who joined in these good wishes. – Private Secretary. 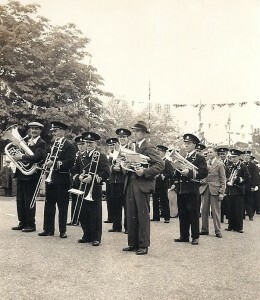 Headed by the Goudhurst Band, the Parade marched to St Mary’s Church for a service conducted by the Rev. H.G. South. The church was filled to capacity. After the service, at 11.00am the Parade re-formed in Church Road to see a new Union Jack hoisted on the church tower while the choir and congregation sang the National Anthem. 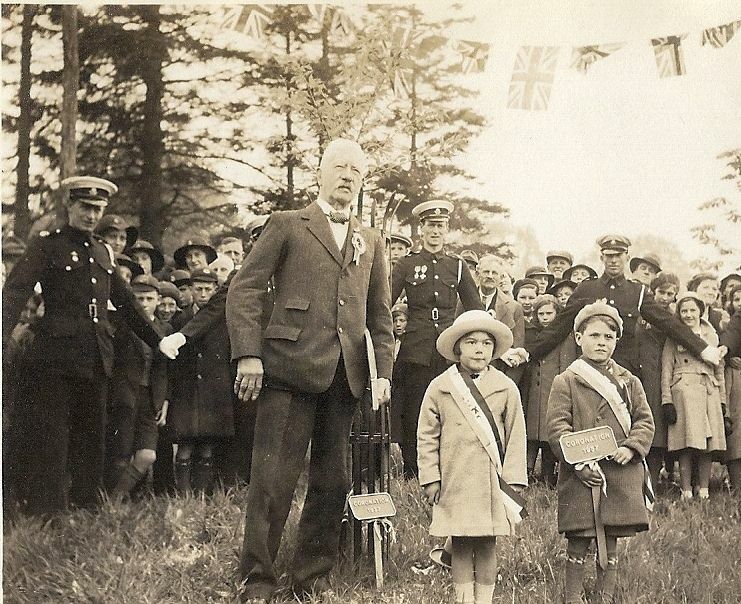 The Parade then moved on to Tattlebury Corner where five year old George Relf and five year old Elizabeth Arnold, the two youngest pupils in the village schools, fixed commemorative plates on trees that had already been planted by the Horticultural Society. They were both presented with souvenir biographies of the Royal couple as a keepsake. Commemoration over, the Parade dispersed and the Old Folks gathered in the Village Hall where 79 sat down at midday to a hot dinner and refreshments. Those who were not able to attend were later given gifts. Sports for the Children and Adults were scheduled to start at 1.30pm. But, by then the rain had started to fall and the sports were postponed until Empire Day, May 28th, when the weather was much kinder and the games went ahead with great success. However, the children’s spirits were not dampened and 256 sat down to a special tea in the Village Hall at 4 o’clock. Each child was presented with a souvenir Coronation beaker. As were a further 138 children who were not able to attend the tea. By the time the tea was finished, the rain had stopped. People put on their fancy dress costumes for the Carnival Procession and decorated prams, bicycles, cars and lorries began to assemble on the Plain ready for judging. It was so popular that the queue for judging stretched from the top of Clay Hill almost to the church. There were 15 different classes to be judged with cash prizes for the winners. 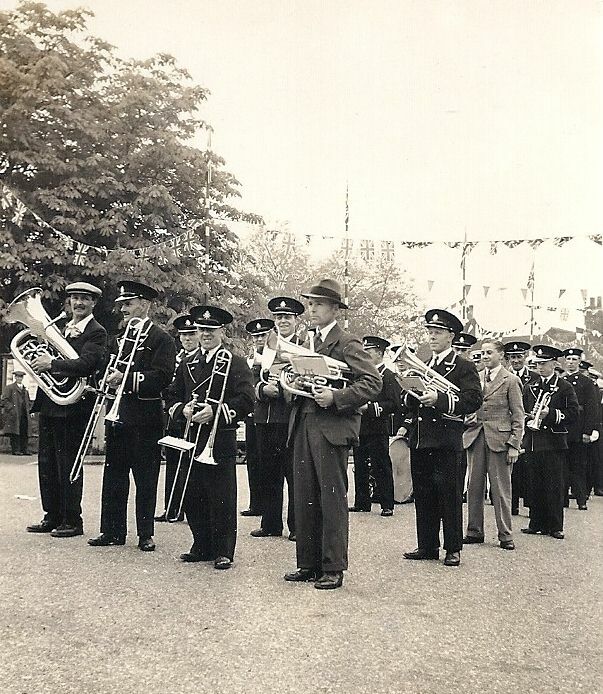 When the judging was complete the Carnival Procession began its short tour of the village led by the Goudhurst Band. They processed from the Plain, round the Chequers Inn, by the Ladies College, and back to the Plain. Prizes were presented to the winners by Miss L. Jessel who also congratulated all competitors on their enterprise. At 8.00pm the King’s Empire Message was broadcast on radio and relayed to the crowd on the Plain. As darkness fell, the lights among the village decorations began to glow. The Scouts were selling their home-made torchlights ready for the torchlight procession. They had made 420 but a good number of them were accidentally ignited before Coronation Day leaving some 270 for sale at 3d each. The street became a sea of bobbing lights as people gathered with their torches for one final procession. At around 9.30pm the people processed by torchlight from the Plain to the Chequers and back to the Five Fields where the evening was rounded off with a fireworks display and the lighting of a huge bonfire. Celebrations around the bonfire were brought to a close with the singing of Abide with Me and the National Anthem. Some made their way home but around 300 revellers, with energy to spare, went on to a dance in the village hall which continued into the early hours of the following morning. It I recorded that two strangers had travelled from the wilds of Derbyshire towards the South coast and, as they passed through towns and villages, they decided to award marks for the decorations they saw. When they neared Tonbridge they were still undecided as to where top marks should be awarded. But, on entering Goudhurst they found their winner. 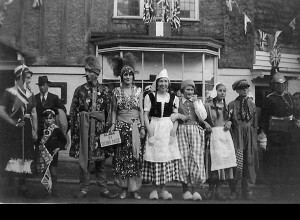 In the opinion of the two travellers, “Goudhurst was the gayest and most artistically decorated village between Derbyshire and the coast” and so was awarded top marks. 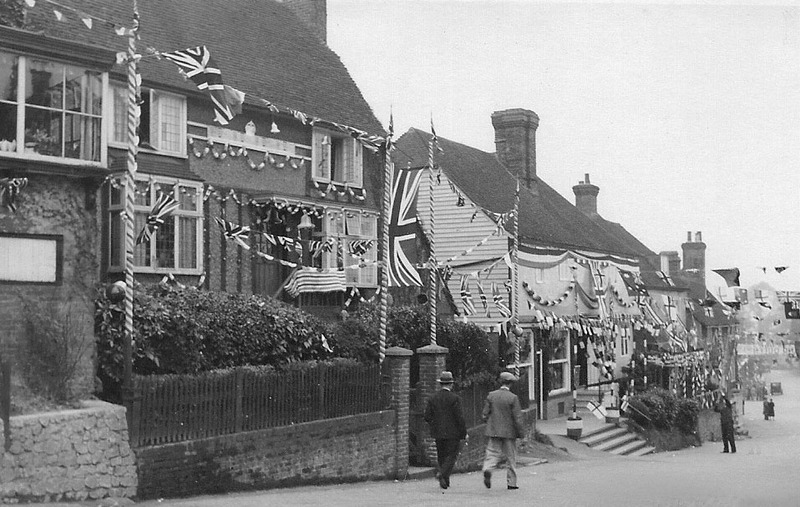 A few miles outside of the village, Mr Fegan’s Homes at Horden had been decorated with banners, pennants and flags. A special banner reading “Long Live our King and Queen” had been strung across the main entrance gate. The Union Jack was flying from the tall flagpole at the barnyard entrance, and the Canadian flag was also flown in remembrance of the fact that many of the boys would make their new life in Canada when they left the Homes. The outstanding feature of the decorations was the coloured electric light display on the roof of the water tower. At night the lights could be seen for miles around. During the morning of Coronation Day there was a short service for the boys and the staff in the Farm Chapel.. By the afternoon rain was falling and so the planned sports had to be abandoned. (They were postponed to Whit-Monday, when the weather was more favourable). Throughout the day the Coronation Service was broadcast on radio. The service, and the subsequent procession of the new King and Queen from Westminster Abbey back to Buckingham Palace, was relayed for all to hear in the Farm Chapel on two radio sets. When the sports had to be cancelled many chose to listen to the radio instead. Later, a celebratory tea was enjoyed by the boys together with the resident staff and their families. The boys, under the guidance of the Farm Manager, Mr H. Beeby, and Mr Wise had built a huge bonfire. It measured 77 feet round the base and was 30 feet high. At 10 o’clock the huge bonfire was lit and there was a firework display which lasted 40 minutes. The honour of lighting the bonfire was given to the smallest boy in the Homes, “Midgy” Harry Clark. The bonfire burned well into the early hours of the following day, long after everyone had retired. By morning, only a pile of ashes remained.